Yesterday went very well, I am pleased to say. The weather was sunny and warm and people were generous in their contributions to the lunch, which was just as well as we had a lot of people turn up for it. The service celebrating our Church's founding was also very well attended: our largest congregation this year. So I start the week with a sense of gratitude as well as relief! There has been much talk here about the Pope's recent overtures to disaffected Anglicans, especially those in the CofE. I find the whole thing rather sad, not because I don't respect the Pope, but because I do. This move seemed ill-timed and ill-conceived. 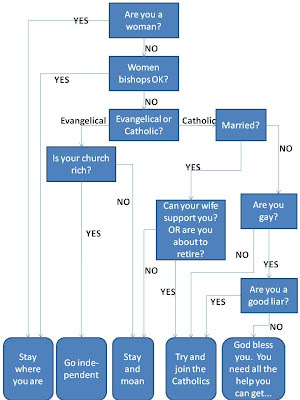 Anyway, I came across this flow chart and thought that while it too was sad, it, nevertheless, made the point in an amusing way.